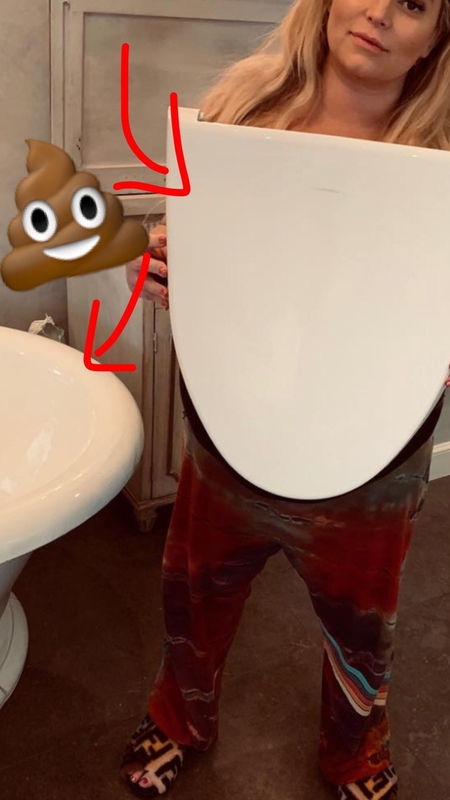 Pregnant Jessica Simpson Broke The Lid Off Her Toilet And All I Can Say Is, "Wait, Why Is Her Toilet Is So Big?" Hi, J. Simps is currently pregnant with her third baby and she has some really SWOLE ankles rn. She’s recently been sharing her struggles with pregnancy via Instagram, like, um, breaking off the toilet seat lid. Understandable and believe-able if you’ve ever been pregnant and REALLY CONSTIPATED. But, breaking off the toilet lid isn’t what shocked me – what shocked me is the toilet lid looking like it fits on the bathtub. Two people can poop at once on this thing! It’s massive. And it could fit on her tub. Wait, IS THIS EVEN A TUB?! *scratches head* Nah, that can’t be her toilet. But, what if that IS her toilet? Do all celebs have toilets the size of bathtubs? Are John Legend and Chrissy Teigen pooping together in unison on the same giant toilet seat? I need a drink. What if Jess meant she is going on seven years with her hubby as life partners…and as pooping partners? Jessica, please send us a pic of your toilet. We need to see it in all its glory! Until then, I’ll be waiting over here on my tiny, non-celeb one.